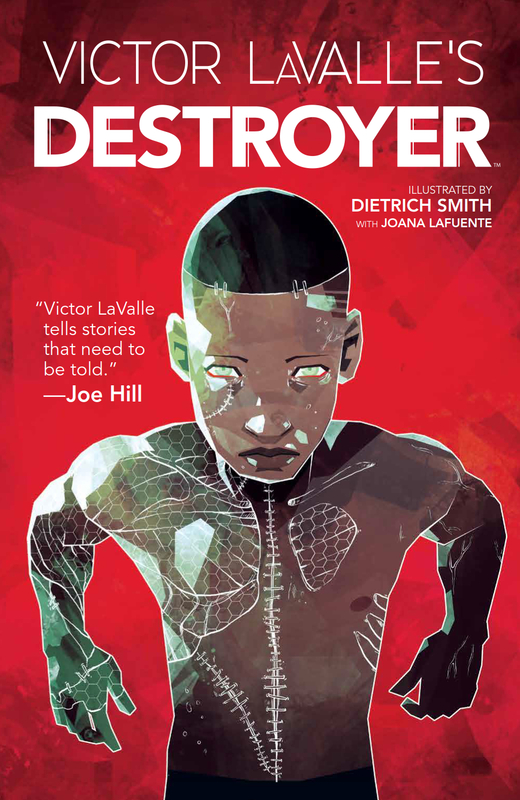 Victor LaValle's Destroyer Review – AiPT! A modern Frankenstein tale that blends sci-fi, horror, and the all-consuming nature of grief. Victor LaValle’s Destroyer from BOOM! Studios collects all six issues of Victor LaValle’s modern Frankenstein tale in which a woman resurrects her son who was unjustly murdered by police. This is a story about racial injustice, human beings’ relationship with technology, revenge, grief, the environment, optimism prevailing over despair, and even utilizes Shelley’s original monster as he travels from Antarctica to America and encounters the story’s characters. Destroyer juggles a lot of themes, but does it do so successfully? The biggest thing holding Destroyer back is its six-issue run. While reading the series, I loved that Victor LaValle touched on so many crucially important themes and topics, but because of the series’ length I felt that none of them had time to shine or develop quite enough to leave a lasting impression. If this series went to twelve issues instead of six, there may have been more time to let all the ideas LaValle includes breathe. Because of the limited run of the series, topics like melting icecaps feel like they are mentioned in passing and left more for the reader to ponder after reading rather than being explored in a meaningful way. The plot felt particularly rushed in the last issue where so many things had to wrap up in twenty-some pages that I wish it even had one or two more issues to end on better footing. However, the most well developed themes were also the most major in the series, namely racial injustice and optimism prevailing over despair. LaValle’s protagonist, Dr. Josephine Baker, is immediately interesting and affecting. Through her complex portrayal of a vengeful genius demanding retribution for her son’s murder, LaValle takes the difficult task of conveying a mother’s grief for her lost son and does so in a believable way. Her actions and choices throughout the series are extreme, but they feel justified because of how well LaValle conveys her rage against her country’s system of injustice. I completely understood and at times related to how so much anger and grief could drive a person to such extreme measures. What I liked in particular about Dietrich Smith’s penciling work throughout the series was the highly detailed backgrounds. Each setting be it Antarctic glaciers, a messy bedroom, or a metallic laboratory are created with a lot of attention paid to texture and perspective. Various inking techniques are used to make posters feel different from comforters or drywall. When the storytelling shifts more into metaphor and representative imagery late in the series, Smith keeps up the pace, bringing stone statues and rusty metals to life through the use of black ink to convey those textures. Smith’s work on faces throughout the series remained consistent, but there were a few moments where a horror element like Frankenstein’s monster or Dr. Baker’s son, Akai, looked more cartoony than creepy, but never to a degree that spoiled the moment. Color-wise, Destroyer deals mostly in grays, blues, and dark greens, but occasionally brightens up when the scene demands it. Joana Lafuente does a good job of coloring the pages so that all those cooler colors never feel like their blending into one another, letting a dark green mech stand out against a gray lab next to glowing blue technology. The recurring effect used to show nanobots in action looks particularly well rendered with pale blue lights mixing with black to convey movement and activity as the bots swirl about. Jim Campbell’s letters are used sparingly outside of the word balloons, usually signifying time and place and I appreciated that careful use of action effect words so as not to distract from the dialogue and illustration. Destroyer is an ambitious project that tackles a lot of important themes and ideas and though I feel only a couple of them are really developed enough to leave an impression, I appreciate how thorough the series attempts to be. This is a series that questions not only the state of humanity with regards to how we treat one another on an individual basis, but how our actions affect the world on a national and even global scale. Though I wish the series was long enough to better explore all its ideas, it succeeds in telling an affecting story that is sadly all too relevant to the times in which it’s being released. An affecting, ambitious series held back by its short length, but elevated by consistent, detailed artwork throughout. Dr. Josephine Baker is a complex, sympathetic, and tragic protagonist that immediately captivates. Dietrich Smith’s highly detailed backgrounds and consistent character work along with Joana Lafuente’s colors keep all the story’s moving parts distinct and interesting. The series grapples with urgently important themes and topics with regards to racial injustice, the environment, technology, and more. Because there are so many ideas at play in so short a run, some of the themes feel much less developed than others. An occasionally goofy face or effect, usually when the moment called for something horrific or unsettling.